Have you ever flown over big snow capped mountains someplace? Do you remember being glued to that foggy airplane window? I had the rare opportunity to enjoy a beer the other night with a friend after Wunderkind and Schnickelfritz went to bed. After we talked about our kids we talked about travel and adventure. His brother flies from Alabama to Alaska for work periodically. He said the first time he went, when it was clear enough to see outside the plane’s window, he saw a mountain goat on a cliff side. That goat, except for its own abilities, it would have otherwise been stranded. Remote and unreachable. His brother feels that this is illustrative of what Alaska’s wilderness was: A frontier with places that no man could go. John Quillen’s self-published book, Tempting the Throne Room: Surviving Pakistan’s Deadliest Climbing Season 2013, (2013). John Quillen has crossed my radar tangentially last year after the terrorist attack at Nanga Parbat Basecamp. You might have already read some of the quotes or information he provided in the aftermath; Quillen was in the region and provided media some on-the-ground information and has since written this book about the summer of 2013 in the Karakorum. 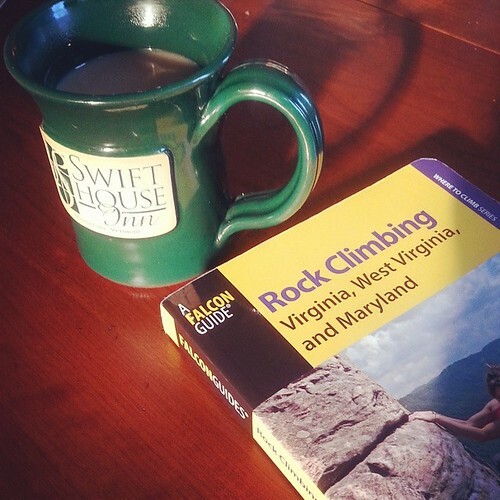 Eric J. Hörst’s regional guide, Rock Climbing Virginia, West Virginia, and Maryland, 2nd Ed. (2013). I’ve lived in the Mid-Atlantic for a dozen years now and have only gone back to my home park, the Adirondack Mountains, a few times and Alaska only once in that span. So I decided to take an active interest in my “immediate” surroundings. After reading portions of this book with its rich illustrations by Stewart Green, I suddenly want to spend some time in Fayetteville, West Virginia and hang out with Pat Goodman at the New. John Long and Peter Croft’s Trad Climber’s Bible, signed by John Long. I received this copy as a thank you for some work I did this past winter in promoting the late Michael Ybarra’s book about the McCarthy Era in Washington, Washington Gone Crazy. Long knew Michael and they even climbed together once. Michael’s sister was very generous in thanking me this way. I’ve read random snippets and feel as filled as reading from a gentle religious devotional: comforted and empowered. I wonder what will happen after I take it in in full. « Where is Your Mystery Mountain?